Our signage over the course of its rusting process. My name is Donny Rambacher and I am the newest member of the Array team. 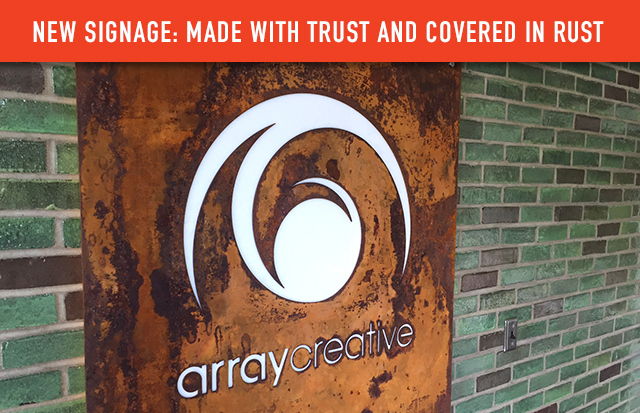 A little over a month ago Array’s principal, Eric, tasked me with creating a piece of signage for the office entryway. The sign was to be 41×45” and could be made of any material of my choosing. The current entry is made of green ceramic brick and glass. Architecturally speaking, the brick is Array’s most unique feature. Everyone notices and comments on their eye-catching reflections upon entering our space. The previous tenants hung their signage on the green wall and left behind four holes and four screws begging for future usage. I really enjoy using natural materials in my work such as wood, metal or salvage goods. Initially, I imagined our sign would be cut out of a sheet of metal so the green brick could be seen through the holes of our logo. Since one of Array’s primary colors is orange, I wanted a way to find that color naturally: rust. After the frustration of a fruitless Craigslist search, I grabbed our studio manager and VP, Ian, and we hit the junkyards. Akron has a wealth of scrap yards and they all exist within a square mile radius of each other. One hot and sticky Friday afternoon, Ian and I marched out the door in our business casual attire and knocked on the doors of six local recycling centers. Ian jumped right in and risked his life for our signage. These places were full of characters, some who were willing to talk and some who wouldn’t give us the time of day. We stomped around a couple dusty and rust filled places, but as it turns out finding rust is easy, finding a flat sheet of metal large enough for our needs was the tough part. Slightly discouraged, we came back to the office and I began seeking other means of sourcing metal. I started looking online for a sheet metal that would rust to a bright orange finish. After some searching, I came up with COR-TEN steel, a weathering steel designed to form a stable rust-like appearance. At first I planned on purchasing the metal from one place and having our logo laser cut at another place. I soon realized the best way was to find a business who can both provide the metal and cut it all in one fell swoop. I talked to laser cutters around the country and after weeks of searching determined our best option was only 40 minutes away in Cleveland. J.P. Palmer at Repko Machine in Brook Park was able to source the steel and cut out our logo for a reasonable price (they even provided a second sign for little additional cost!). A week later, Ian and Shawn journeyed to Cleveland to pick up our pallet full of signage. Each sign weighs about 50lbs and has edges sharp enough to be considered dangerous. Now came the fun part, the rusting process. I researched the best and fastest way to rust metal and came up with several results. The first and most important thing to do was to clean the steel with dish soap to eliminate any oils, which would prevent the metal from rusting. Finally, it was onto the experimenting! Repko kindly provided the letters left over from cutting. I used each letter to test various substances to see what rusted the metal best. I soaked some letters in saltwater, covered some in muriatic acid and set some in the sun to test the role played by weather. As it turned out, soapy water worked the best for a unique and immediate rusting of COR-TEN steel. Over the course of two weeks, I rusted the metal to a fine patina. I then let it rust using only the humidity in the air for an additional week. The final sign hung on its green wall. We hung the metal sign on the green brick wall only to discover that a a strip of mortar ran right through the letters, rendering them illegible. We needed to include something behind the metal to contrast the rust and ensure readability. I reached out to our friends at TKM and they were able to provide a sheet of white acrylic. Not only does it help with legibility, but it also has a reflective quality just like the bricks. I glued the acrylic onto the back and let it cure for 24 hours. I then attached LED lights to the back of the sign using 3M Extreme Mounting Tape and concealed them to the perimeter so they would not be visible from the side. With the help of my coworkers we hung the sign on the wall, discreetly ran a cord out from the left side to operate the lights and voila! The sign looks awesome hanging on our wall, but don’t take my word for it, come see it for yourself. Our doors are open 9-5 Monday through Friday. We will be happy to show you around!